1. Carly is the less nervous of our two dogs. For her, distracting her with an awesome treat is enough to get her through the fireworks or storm. After loading up a Kong with peanut butter and treats, we freeze it so we always have one ready. A frozen treat takes more focus and takes her longer to get through it. 2. 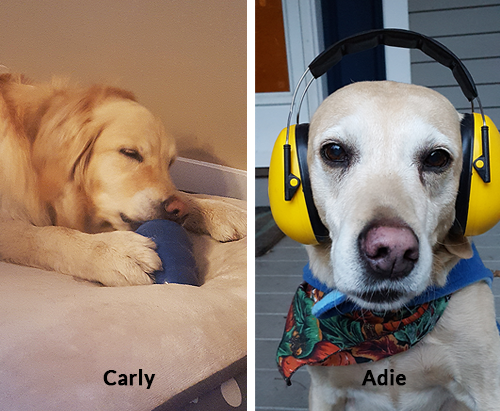 Adie is our nervous Nellie – we can hear furniture or heating baseboard shaking if she’s touching them. Sileo came out last year and is a game-changer for her. Manufactured by Zoetis, it is a gentle medication for noise phobias. A gel that we place in her cheek, It doesn’t knock her out and she stays alert – it just relaxes her. We can adjust how much we give her based on how nervous she is. Most importantly, she becomes part of the family again.